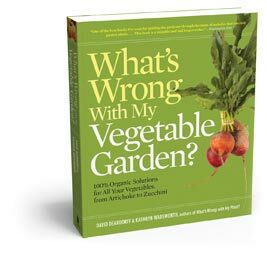 David Deardorff and Kathryn Wadsworth have just published What’s Wrong With My Vegetable Garden? 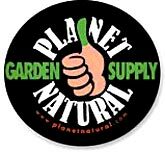 : 100% Organic Solutions for All Your Vegetables, from Artichokes to Zucchini. For them, as for many organic gardeners, half the solution lies in prevention, and a key to prevention is polyculture. When they talk about putting the right plant in the right place, they mean not just giving it the soil, light, and water that it needs, but the growing companions as well. For the show, David and Kathryn describe a number of possible polyculture combinations, such as slipping asparagus into a perennial flower garden or using melons instead of squash in the Three Sisters combination traditional with so many Native American tribes: corn, pole beans, and squash. They suggest planting radish with carrots, as pulling the radish will help loosen the soil around the slow-growing carrots. It became clear in the course of this interview that I need to know my plant families better. One rule of thumb David recommended was to mix a member of the daisy, carrot, and mint families into every bed. His example was to bring chamomile, (from the daisy family), cilantro (carrot) and basil (mint) into a tomato bed, along with beans. Well, I’d never thought about what families those herbs belonged to, and the cilantro and basil IDs took me by surprise. Of course, the Latin names would have helped. If I knew them. This show covered so much that when I try to describe it I tend to go on and on. The practical combinations I’ve dwelt on made up the middle portion of the show, which started with an overview of polyculture and ended with some tips about dealing with pests and problems in an organic way. I already plant basil and carrots in my tomato beds (also early lettuce); beans I shall have to try. Polyculture may be the last nail in the coffin of the old kitchen garden. David Deardorff and Kathryn Wadsworth garden in Port Townsend, Washington, where they have mostly cool, coastal weather. However, they have also lived and gardened in Hawaii and New Mexico, so they know their way around several different gardening zones. What’s Wrong With My Plant? (And How Do I Fix It? ): A Visual Guide to Easy Diagnosis and Organic Remedies. Timber Press, 2009. What’s Wrong With My Vegetable Garden? 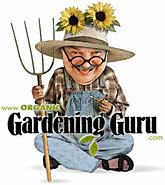 : 100% Organic Solutions for All Your Vegetables, from Artichokes to Zucchini. Timber Press, 2011. “Sustainable Solutions, ” Chapter 1 in The New American Landscape: Leading Voices on the Future of Sustainable Gardening, Edited by Thomas Christopher. Timber Press, 2011.